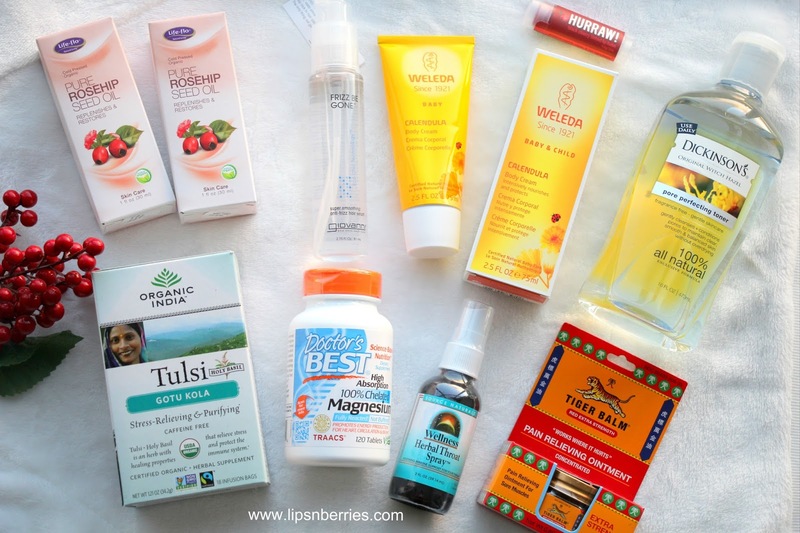 iHerb.com Order- July 2016 **Use PGF661 for $$ off your first order** | LIPS n BERRIES! Money has been leaving my bank account left right & centre this month. This mid year slump seems to be draining all my moolah. Does it happen to you? All expenses come visit you at the same time. And then you decide to shop online. I admit I feel a lil guilty. Time to impose a shopping ban I think. 1. 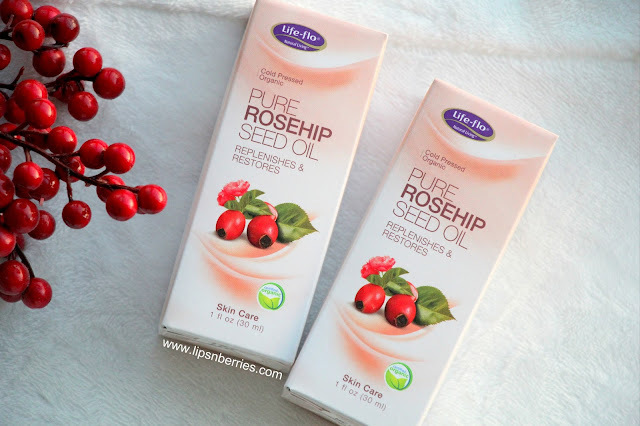 My regular supply of Life Flo Rosehip Seed Oil- $8.25 each- AS ALWAYS! I figure this is the reason I go on iHerb but then I order some more. Its my favorite face oil and even after 3 years of using it everyday my love affair with this one is still going strong. Full review here. 2. Giovanni Frizz Be Gone super Smoothing Hair Serum- $8.98 - This one is a mistake that turned out to be a boon. Sunshine needed a heat protectant spray. I read reviews on iHerb and this one seemed like a goodie. Little did I know that this was a serum that is both anti-frizz and heat protectant. He's not a fan of serums and that slick oily look but my bushy hair have been loving this one since I've run out of my Kerastase Oil. Its amazing for the price and does the job well! 3. 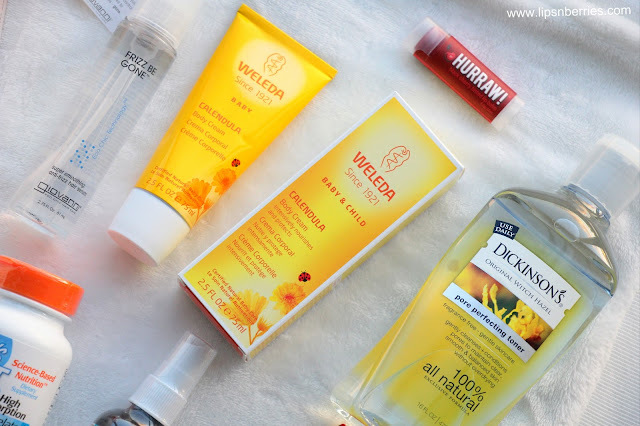 Weleda Calendula Body Cream- $13.74 - This is for a friends baby, who is making a switch over to natural skin and bodycare for her kids. I couldn't recommend a brand better than Weleda- 100% Natural, Organic & Plant based. 4. Hurraw! 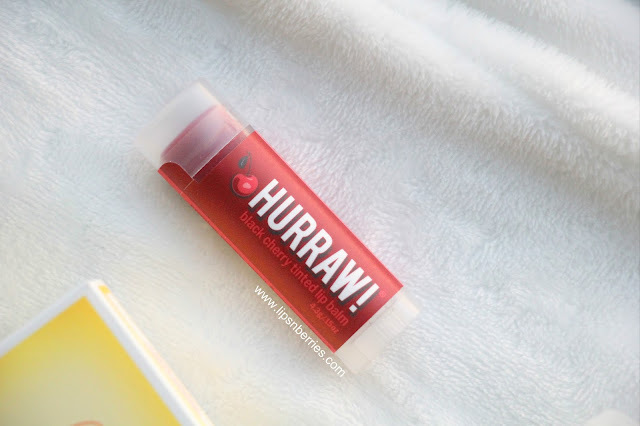 Black Cherry Tinted Lip Balm- $5.28- My favorite lip balm that I have to try every flavor of. I think they make about 21 variants so I still have a long way to go. These are super affordable, delicious, 100% natural, organic & plant based. Nothing bad touches my lips!! Full review here. 5. Dickson's Original Witch Hazel Pore perfecting Toner -$8.29- This one is for my flatmate who has oily skin. 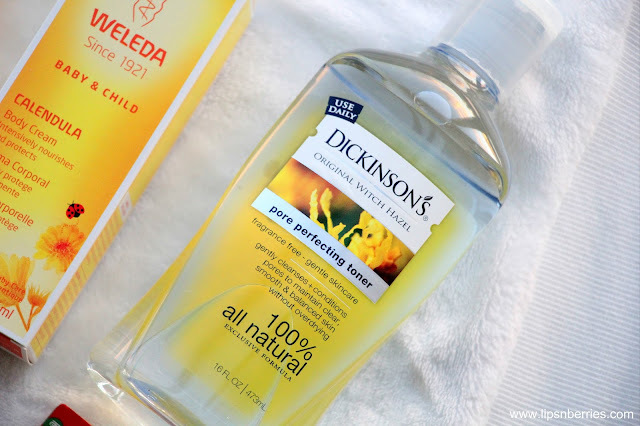 Witch Hazel is known as a great natural toner for those with combination and oily skin. It shrinks pores and clears complexion. I think she likes it. 6. Organic India Tulsi Gotu Kola Tea - $5.77- Tulsi is Indian Basil/ Holy Basil- the most revered herb in India. We even pray to this plant. Its a wonder herb too that helps with various ailments and aids in detoxification too. Gotu Kola is an Indian herb that is a new rage in Western world. It helps with Stress Management. Worth a shot! And it tastes all right too. 7. 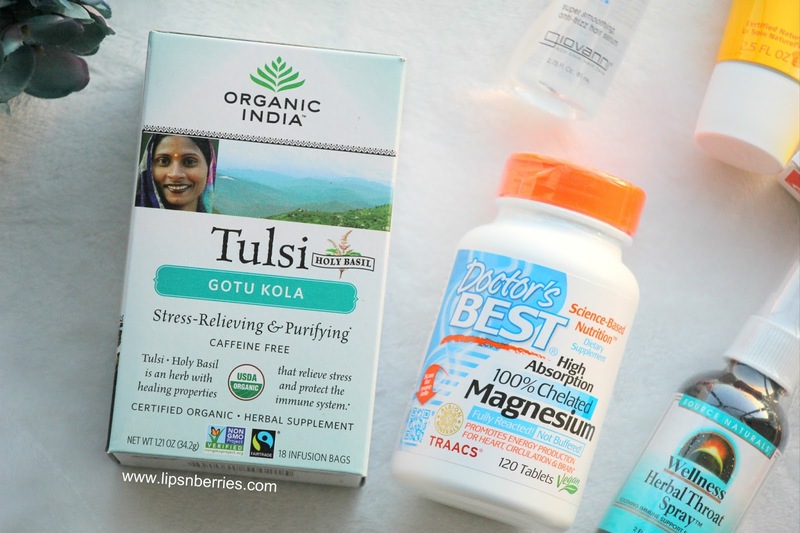 Doctor's Best Chelated Magnesium Tablets - $12.80 - I've been asked by my Physio to take Magnesium supplements daily. Apparently, it helps with muscle recovery and gives an energy boost. I've been taking these everyday since but haven't noticed any improvement in my back pain yet. Here's hoping this works coz I could really do with some relief right now. 8. Source Naturals Wellness Herbal Throat Spray- $14.67- This product was the reason this iHerb order was made. I was almost running out of my last one. Throat sprays are a must have in my household as we are pretty susceptible to this nasty ailment. I hate sore throats to the core and Sunshine finds it unable to lie down when he has one so we used to stock up on Diaflam Throat Spray regularly. Diaflam is expensive (about $26) but is super effective at its job. We wanted to find a natural alternative to it so I started experimenting. This throat spray is even better than Diaflam. Coconut oil is the second best. If you ever feel like a sore throat creeping up or you've lost your voice from all the shrieking at that concert (happens too frequently with me) throat sprays are great at nipping throat infections in the bud. Try it! They will change your life. Two sprays before you hit bed and Voila! I love that this one is 100% natural and so soothing. Doesn't taste the best though but 200% recommended. 9. 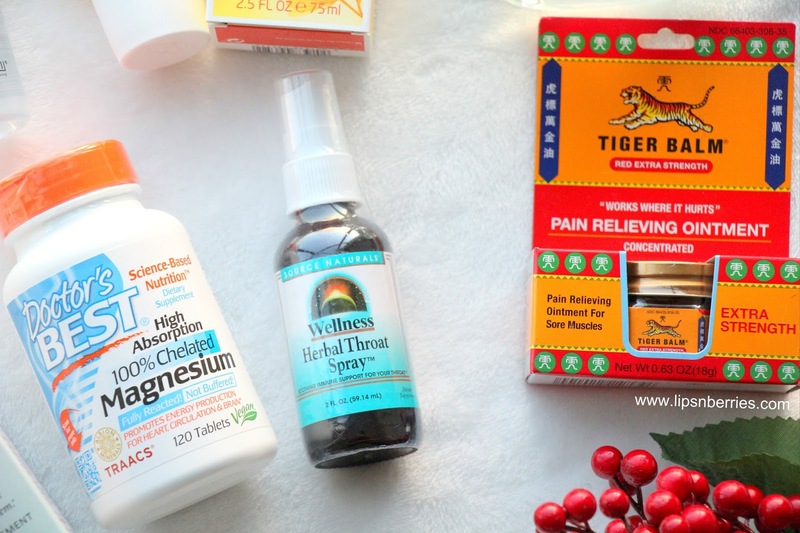 Tiger Balm Pain Relieving Ointment- $9.73- Because you know! Who doesn't know about this Chinese wonder? Its a herbal rub great for aches and pains. I was running out of my supply so this is a back up. And that is all for this month. If you've never shopped from iHerb, use my affiliate code 'PGF661' to get $$ off your next order. If you shop from them, please hit me up with your product recommendations in the comments below. I love shopping from iHerb and finding unknown little gems. FYI I always use the DHL shipping option because its super fast, secure and actually works out to be the cheapest if you order above $40. P.S. I've previously shopped from iHerb a huge number of times..from my Real Techniques Makeup brushes to Ecotools vegan brushes to ELF Cosmetics to every health supplement I need. 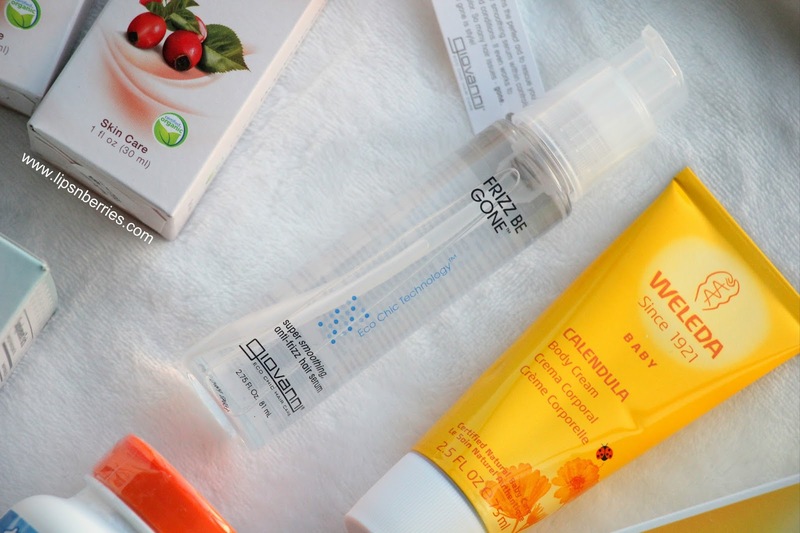 Here are some haul posts if you are looking for products to add to your cart! Yeah..I love iHerb way too much!